WeWaWri: She’s Only Human . . . 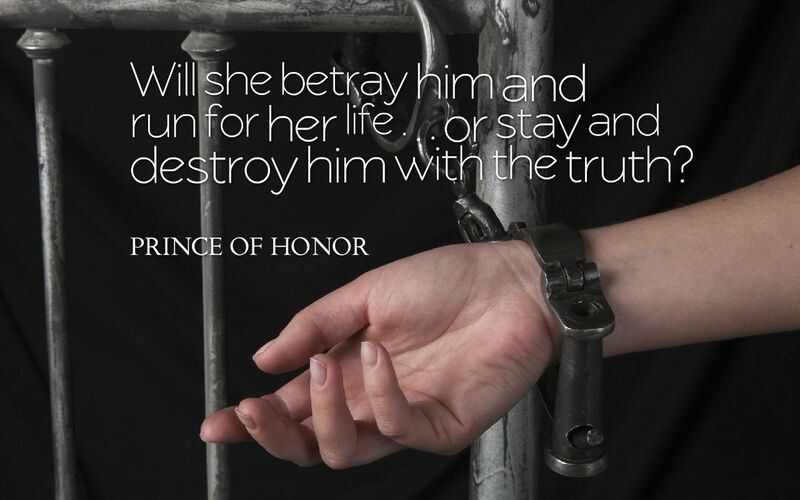 If anyone understands making and surviving mistakes, it’s Sylvia Terriot, a heroine in her own right in PRINCE OF HONOR, but doing empathetic secondary duty in my WIP, PRINCE OF DREAMS, as she quizzes our hero on his choice of lady loves. This scene immediately follows last week’s as Sylvia teases Kip about replacing her in his,ummmm, heart. "I had to let go of the dream or risk Row taking my life," Kip teased, grinning as she rubbed her lipstick off his lips. "Hmmm, and now you have a new dream that Turow hinted is inappropriate, so I like her already." "She's part of the job I'm doing in New Orleans." "The job's not all you've been doing. Good for you." Catching his uncomfortable squirm, she frowned then prompted,"Not good?" "Not one of our kind." "Mia Guedry is here in these hallowed halls tonight and the ceiling hasn't caved in." "She's more than just an outsider, Syl, she's . . . human." A startled blink and a stammered, "A . . . what?" Of all the objections a family might have to a prospective new member, who would have thought THAT would be it? Of course, if you’re part of a secretive band of shapeshifters . . . and being human isn’t the WORST of her sins. I guess that leads us to next week’s post. Sigh. Now you know why it’s taken me soooooo long to get to the end of this book. WeWriWa: A Blast from the Past . 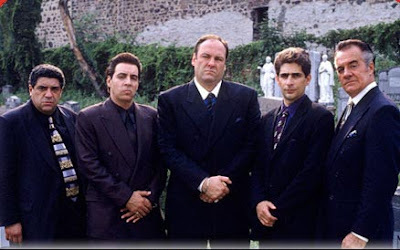 . .
One of the absolute best things about writing a series is the ability to bring back characters you love! While rushing toward the finish line of PRINCE OF DREAMS, I’m indulging in a bit of nostalgia. For the next few weeks enjoy a fun scene between hero, Kip, and his “first” infatuation who was actually ALL the brothers’ first, their rite of passage into manhood with a good girl forced to bad things by her ambitious mother while searching for her own prince to rescue her . . . or the other way around. Say hello, again, to the determined survivor from PRINCE OF HONOR, Sylvia Terriot . . .
Kip turned away from Cale's door right into Sylvia Terriot's arms, arms that insistently pulled him down onto her luscious lips. His brain kicked in quickly enough to stop his body from responding. Sylvia had been his first and most memorable occasion until Ophelia Brady. He'd crushed on her since adolescence, as had all his brother's, yet somehow, he hadn't been as shocked as the others when she ended up with the most reserved of his kin. She and Turow, despite their polar opposites, fit perfectly together, but the first spark he'd felt for her was still evident in Kip's blush. "Hey, Syl," he muttered like a ten-year-old. "Hey, yourself." Before standing down from her tiptoes, she gave a curious sniff about his collar demanding, "What's this? Are you cheating on me?" If there’s anyone who knows what it’s like to fall from grace, it’s Syl. That’s what makes her the perfect confidante. A tough realist when it comes to life’s hard knocks as well as its indulgences, she’s evolved from traitor to her clan to one of its most valuable assets. Here’s a look at her book and her prince . . . 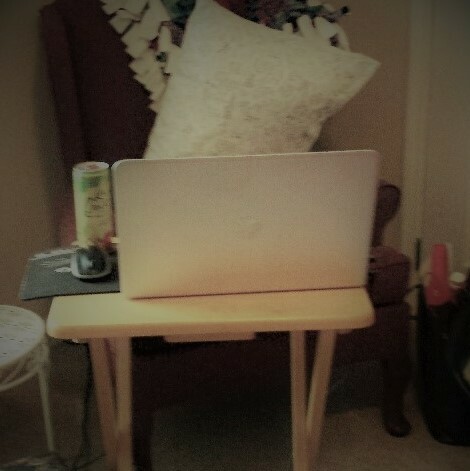 If I didn’t get to visit all my fellow Warriors last weekend, it’s because I was on the second of THREE writing weekends away, this last one at my critique partner’s home where I set up my little corner of writer’s heaven in a bedroom, so I could rise and shine before the actual shine without waking anyone else up (and without coffee until they did!) . . . and managed to get to 96K! This weekend is my Mid-Michigan RWA chapter meeting then it’s back to the keyboard and hopefully, the finish line!! 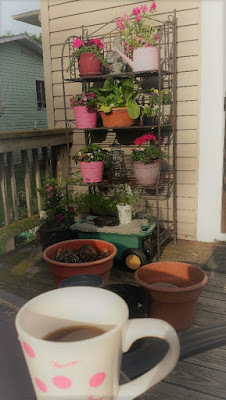 For more on the “House of Terriot,” visit my Friday post for the SPLASH INTO SUMMER BLOG HOP where I’m showcasing my H.o.T. heroes and giving away an Amazon gift card. Happy almost Summer, fellow Warriors. Let’s see what you’ve been doing . . .
SPLASH INTO SUMMER with H.o.T. Shapeshifter Princes! Is it H.o.T.in here, or is it just me? 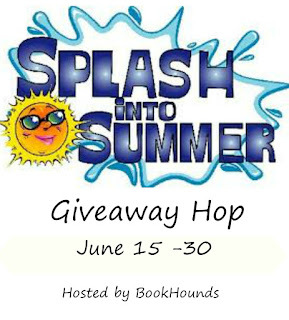 I'm raising the heat index in the SPLASH INTO SUMMER GIVEAWAY HOP, with the shapeshifter princes from my "House of Terriot" series. Feast your eyes and prepare to turn up the A/C, 'cuz things are about to get steamy . . .
As I finish up the last few chapters of PRINCE OF DREAMS, the last in the 4-book spin-off from my "By Moonlight" dark paranormal shapeshifter series, let me introduce these rowdy, rocking bad boys who bring the house down while struggling to save theirs . . .
Want to get up close and personal with this dark, deadly and delicious quartet who serve their king, protect their clan and search for females strong enough to tame them? Here's a tease . . .
a Rafflecopter giveaway I'll be picking a winner at random. It could be you! Watch for an announcement on my Facebook author page on July 2! Until then enjoy the heat and have fun visiting other blog participants! WeWriWa: Keep on Writing On! Nothing like the quiet of a new day, a cup of Keurig coffee and a waiting computer screen . . . and a house full of people still sleeping in! 5:00 am last weekend and I’m firing up PRINCE OF DREAMS on my way to 90K! What an ab fab Write In with four other crafty people either writing or scrapbooking for three whole days miles and miles from every distraction. Sigh! And that’s where I am again this weekend . . . a different place, a different group, but back at the keyboard with the dawn while getting in some needed time with the Magnificent Seven in my critique group. Last week, my heroine was about to meet “the family,” an always stressful situation multiplied by our hero’s warning that he’s afraid for her safety. Not only are they ‘different,’ they’re not from the same genetic pool! His caution has her reconsidering, but this gal is not a quitter . . .
Time to go all in or fold. I can’t believe this book is nearly done! I almost hate to leave the comfort of composing to enter the realm of prepping for publication. It’s kinda like Kip and Ophelia opening their cozy, intimate relationship to an uncertain reception of many. Am I the only one who feels that way when it comes to opening your work to the public? Anyway, off to pack again for a Fri-Sun of like-minded camaraderie that goes back at least 25 years(!). But first, to the store for more IPA beer. Here’s another glimpse of what I was doing last Sunday. Recognize that rogues’ gallery of writer names? Back to that final 6K! 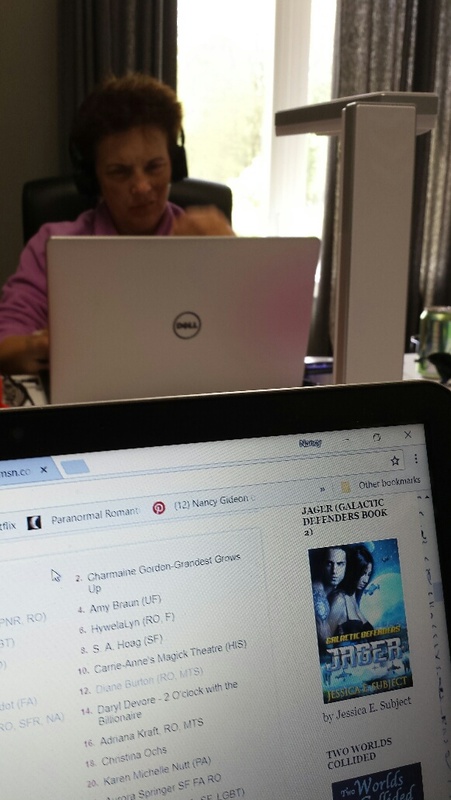 Happy Writing, fellow Warriors!! IWSG: What's In A Name? This month's Insecure Writers Support Group question asks, "Which is more difficult, picking a book's title or naming its characters?" Hmmmm. For me, it's a two prong answer. Naming the main characters is a must before I start writing. What's in a name? Everything the reader needs to know about the character. The name should complement (or contrast!) that individual's personality and status and aid in helping the reader visualize who he or she is. First and last should mesh to strengthen that purpose. It shouldn't jar the reader either by being impossible to pronounce or remember (Hello, Game of Thrones/Lord of the Rings! ), too cutesy/trendy, or too similar to those of other characters in the book. A hero should wear his name like his favorite tailored suit jacket - effortlessly. A heroine should flaunt a nickname like a funky or pricey piece of jewelry. When naming a character, should it matter? 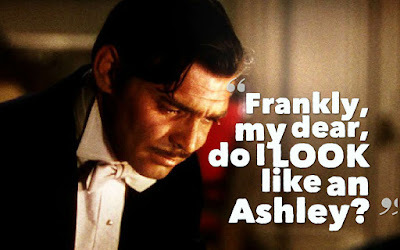 Frankly, my dear, you need to give a damn. Because the hero of the book was named Rhett for a reason, and not Ashley. Titles . . . don't get me started. After decades of being published by the Big Six and not having any choice in what was slapped by the marketing team on your cover (even if four books named MIDNIGHT KISS came out on the same release date! ), having someone ASK what you preferred, not just for the title of one book, but for the series concept, blew me away! Man, that's hard work! Something that hasn't been done before, something reflecting the tone and concept and genre of the work, something eye-catching, thought provoking . . . memorable! I recall sitting for hours with my critique group thinking up appropriate (and sometimes Inappropriate!) words to go with ". . . by Moonlight" (after ten books, it gets harder, believe me!) or "Prince of . . ." And for goodness sake, nothing with "C*cky" in it!!! After 60+ books, I still appreciate the freedom of choice for my book's names and titles, but it never gets any easier. And it never should. Enjoy playing the name game, fellow IWSGers!! Posting: The first Wednesday of every month is officially Insecure Writer’s Support Group day. Post your thoughts on your own blog. Talk about your doubts and the fears you have conquered. Discuss your struggles and triumphs. Offer a word of encouragement for others who are struggling. 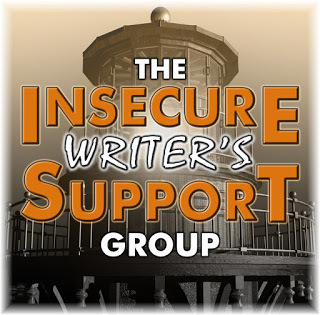 Visit others in the group and connect with your fellow writer - aim for a dozen new people each time.The awesome co-hosts for the June 6th posting of the IWSG will be Beverly Stowe McClure, Tyrean Martinson, Tonja Drecker, and Ellen @ The Cynical Sailor! WeWriWa: Family. An Offer You Can’t Refuse . 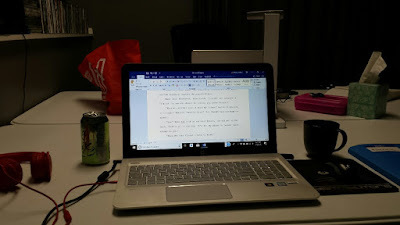 . .
My post is short and sweet this week because I need to pack to head off to a three-day writer’s weekend to do some serious word count damage to my final 150 or so pages. My WIP heroine of PRINCE OF DREAMS doesn’t know what she’s in for when she accepts an offer to meet the hero’s reclusive family who are . . . different, to put it mildly. Her amusement wavered, and she was right to worry, because it was a damned fool and dangerous idea thinking he could sneak her in and none would be the wiser, in believing no one would fault him for taking their greatest enemy’s daughter right to their front door or that she’d be safe beyond it even with him beside her. Stick it out or run like hell? I guess we'll have to wait until next week to find out. I’m enjoying the very late and longed for arrival of nice weather to do some play in the dirt therapy on the patio. It’s still a work in progress since the temps have been in the stifling 90's but have finally agreed to be sensible 70's. Hope to finish up when I get back on WWW Sunday between visiting other posts. ANNOUNCEMENT for the “Love In Bloom Blog Hop”!! The winner of the $10 Amazon gift card is Darlene!! I’ll be in touch to confirm! Congrats and thanks to all who participated! Happy Spring and happy writing, fellow Warriors! !